I am a self-described tree lover and so the proposed changes to the Resource Management Act (RMA) have left me, and many others fearing for our notable and second generation trees. The changes are effectively a costly opt-in system, whereby each and every tree will need to be scheduled, either as a grove or individually (In Auckland City the cost could be in the vicinity of $200 per scheduling) in order to receive some protection. Banning tree protection rules, as the Government plans to do, will leave trees in 700 of Auckland’s 800 parks unprotected, and give landowners the ability to cut down any tree that is not in a reserve or listed in a district plan schedule. Chain-saw wielding property developers wanting uninterrupted 360 degree views of the sea, or anyone with a grievance against a tree will have very little standing in their way. 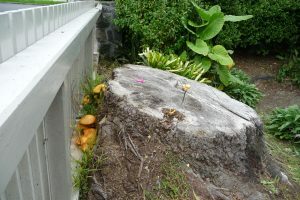 Landowners whose trees have been damaged, or ring barked (as witnessed recently in Waiheke ) will be left with no recourse, other than calling the police and claiming wilful damage, as councils will lose their compliance capability. I figure, tree criminals won’t rate highly in terms of police priorities. It seems ludicrous that under the proposed act, our trees – whose branches provide a home for our birds, whose leaves provide carbon sinks and whose roots prevent coastal erosion – will have to have paid protection. I dare say it will be like choosing between two children. Can’t the new government see the benefit of our carbon sucking, bird-harbouring trees? Waiheke island’s natural environment is intimately tied to its economy, so stripping away these green corridors could have a devastating effect on our ecosystems, as well as, on its role as a tourist destination. In our oral submission to the Local Government and Environment Select Committee this week, we said that we were open to refining the RMA, so it’s not so cumbersome and expensive for the mums and dads of this world wanting to do some harmless pruning on their property. We just don’t want a return of the situation we had in the 1980s when developers could do what they wanted to properties, including stripping away all vegetation. Over the past few years, the RMA has been tweaked so much it has become a better beast than it was a few years ago. The problems that have arisen have been largely with the RMA’s implementation. We think there are ways to deal with tree-work resource consent problems without throwing the ‘baby and the bathwater’ and applaud the fact that, the Arborist Association has offered up some good suggestions in their submission, such as greater public education & improvements to the existing criteria. Surely this is a better solution than the chainsaw massacre that we witnessed in the 1980s? I think if this all goes ahead, it would be good to accompany it with some public education. People in general value trees in terms of their aesthetic values, rather than their value as say a food source for native birds. If they were cogniscent of factors like this, they maybe less like to reach for the chainsaw.